The Demag CC 3800-1 crawler crane can lift up to 715 tons (650 t) at a 39.4 ft. (12 m) radius, has a max load moment of 9,352 ton (8,484 t) and a 640 ft. (195 m) maximum tip/sheave height. 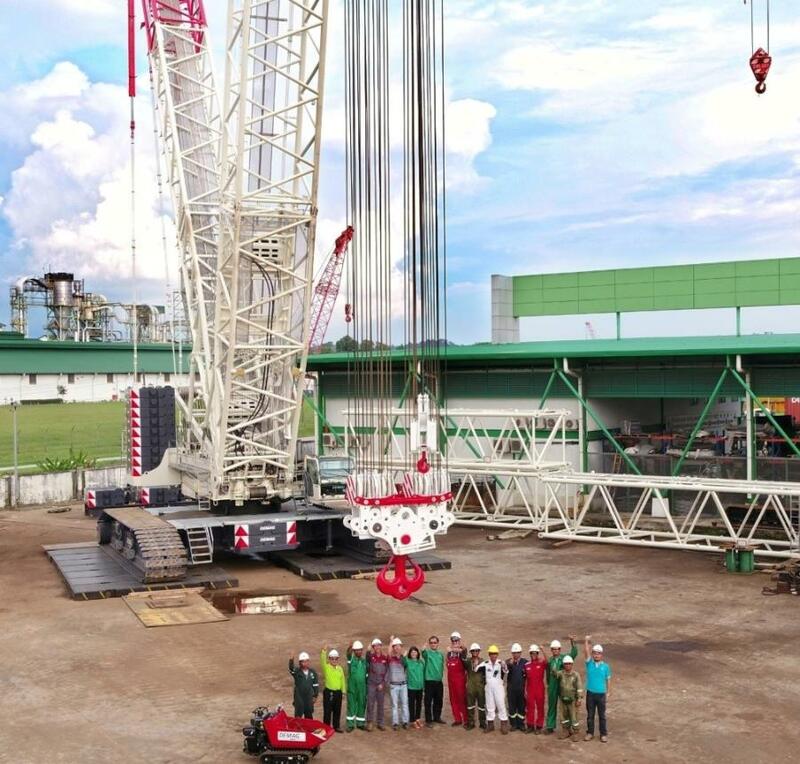 Air-Marine Group, one of the largest Malaysian logistic providers, recently took delivery of a new Demag CC 3800-1 lattice boom crawler crane. This new unit will join a fleet of more than 36 other Demag cranes and enhance Air-Marine Group's lifting capabilities. The Demag CC 3800-1 crawler crane is already scheduled to perform several challenging lifts over the next months. According to William Chiew, group managing director of Air-Marine Group, the company selected this model because of its strong performance and ability to be further upgraded with a boom booster kit. Air-Marine Group, incorporated in 1980, is one of the largest Malaysian Logistic Provider companies existing in the state of Sarawak, Malaysia. The company's services include intermodal containers, heavy and over-dimensional cargo haulage, as well as specialized engineered mover services and mobile cranes rental services. For more information, visit http://www.air-marine.com/. Terex Corporation is a global manufacturer of lifting and material processing products and services delivering lifecycle solutions that maximize customer return on investment. Major Terex brands include Terex, Genie, Powerscreen and Demag. Terex solutions serve a broad range of industries, including construction, infrastructure, manufacturing, shipping, transportation, refining, energy, utilities, quarrying and mining. Terex offers financial products and services to assist in the acquisition of Terex equipment through Terex Financial Services. For more information about Terex, visit www.Terex.com.